The first of several British investigations into the e-mails leaked from one of the world’s leading climate research centers has largely vindicated the scientists involved. The House of Commons’ Science and Technology Committee said Wednesday that they’d seen no evidence to support charges that the University of East Anglia’s Climatic Research Unit or its director, Phil Jones, had tampered with data or perverted the peer review process to exaggerate the threat of global warming — two of the most serious criticisms levied against the climatologist and his colleagues. Lately, there has been a constant squawk from the Right that the stolen emails “proved” that Global Warming aka Climate Change was a big fat hoax. Never mind that virtually none of those making the biggest noise had any idea what the documents and emails really said, they just “knew” they were right. Phil Willis, the committee’s chairman, said of the e-mails that “there’s no denying that some of them were pretty appalling.” But the committee found no evidence of anything beyond “a blunt refusal to share data,” adding that the idea that Jones was part of a conspiracy to hide evidence that weakened the case for global warming was clearly wrong. In a briefing to journalists ahead of the report’s release, Willis said the controversy would ultimately help buttress the case for global warming by forcing the University of East Anglia — and other research institutions — to stop hoarding their data. “The winner in the end will be climate science itself,” he said. The coming response from deniers? That’s not terribly difficult to predict. When they mention the committee’s results at all, it will be to disparage them, disparage the committee and undoubtedly to disparage the British government in general. In the meantime, though, that’s got to sting. 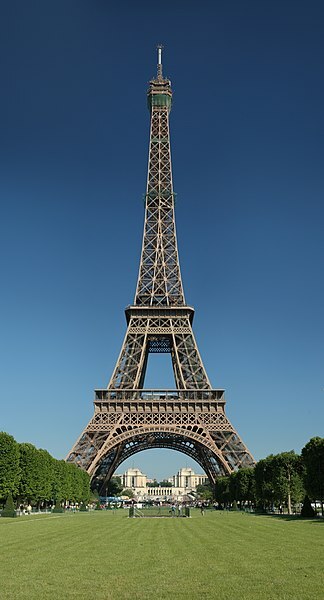 This date marks the day in 1889 when the Eiffel Tower was dedicated. This was yet another landmark that Hitler ordered destroyed in the final days of WW II. Thankfully, his minions did not obey that order. Climbing the first two levels of the tower is a knee wrenching experience for a 43 year old man. especially after being egged on by a trio of teen-aged boys. After reaching the second tier, the elevator to the top was a blessed relief. I did not engage the race to the bottom after the lift returned to the second tier. I finished last. Mom stayed at the base with her trusty camera. This is our open thread. Please feel free to offer your own comments on this or any other topic. In 1858, Hymen Lipman secured a patent on the combination of the pencil and the eraser in a single instrument. He sold his interest in the patent to an entrepreneur for $100.000, a princely sum at the time. In 1875, the Supreme Court of the United States ruled against the entrepreneur (Joseph Reckendorfer) declaring the patent invalid as a mere merging of two prior devices. Think about that – every computer program or algorithm is actually an arrangement of ones and zeros. This view actually held until the early 1980’s when software patents were formally ensconced under copyright law. It was at that point that the courts realized that copyright law was actually more restrictive than patent law. They were plotting a terrorist attack, in the Name of Christ. By taking up arms against the United States, they are unlawful enemy combatants. They should be sent to Guantanamo, waterboarded and subjected to other harsh interrogation techniques until they reveal the rest of their terrorist network. It’s time to go all Jack Bauer over their white Christian asses! They don’t deserve a trial. Reading them their rights is just coddling to terrorists! Somehow, I don’t think you’ll hear the Right-Wing talking heads spewing the above venom. More likely, they’ll be saying what they were plotting is a justifiable reaction to Obamacare. Feel free to comment on any topic! Everyone please join the Critters in wishing our own dbadass a very Happy Birthday! Where’s the remote!? Find it, quick! !